A Trader Joe’s fan blog, with some NYC attitude! 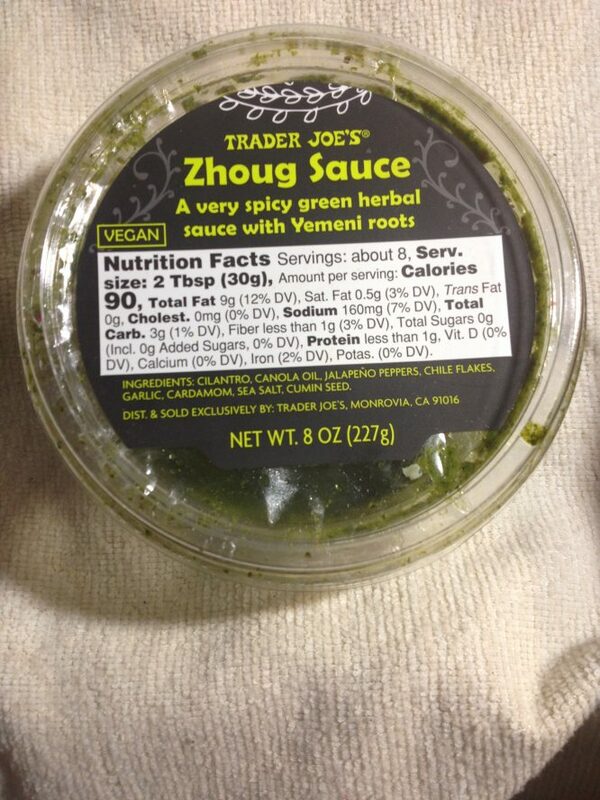 Trader Joe’s ZHOUG SAUCE is a fresh tasting and delicious Middle Eastern / Yemeni condiment. 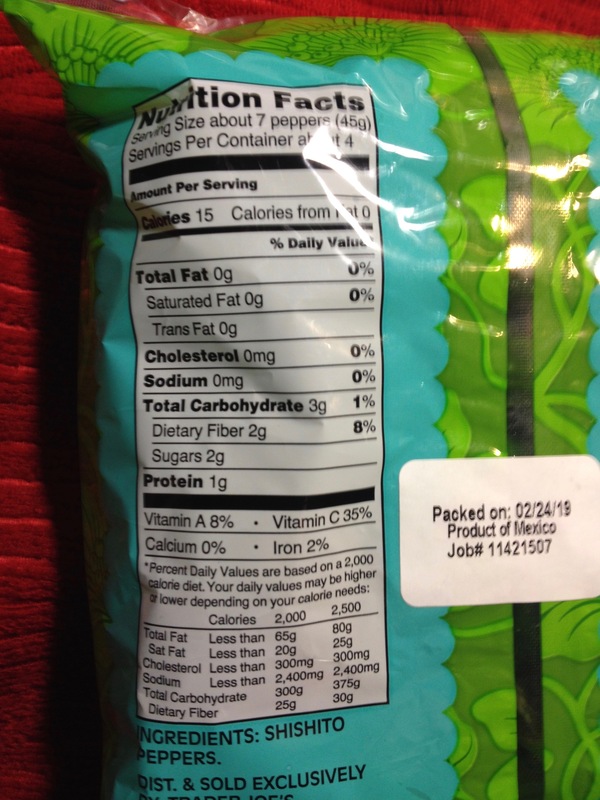 When they describe it on the package as “very spicy” in this case, TJ is not kidding! Repeat – this is “VERY SPICY” as in will knock your socks off spicy. 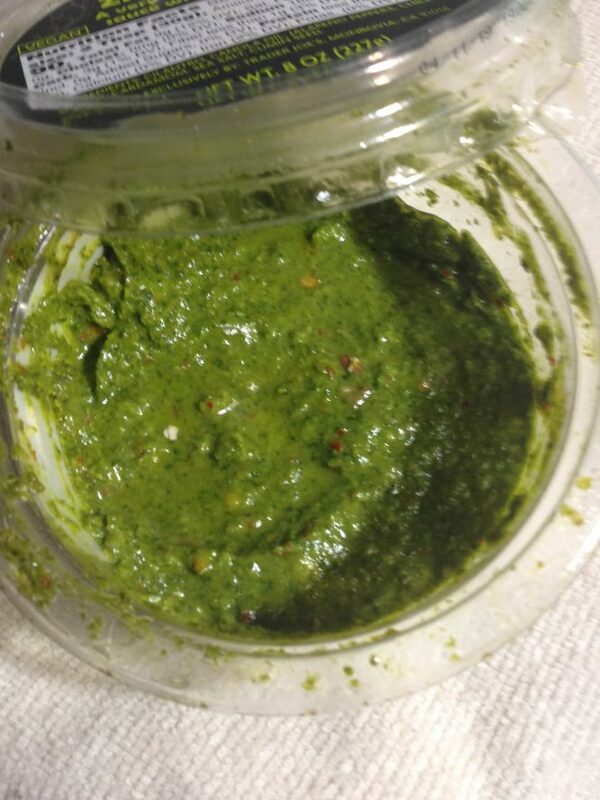 Herbal from cilantro, spicy from jalapeno and chile, seasoned with cumin and cardamon, this stuff is bloody wonderful. I’ve put it on just about everything you can think of…chicken, tofu, eggs, fritattas, pasta…. you can’t go wrong with this on just about anything you put it on, it will make you smack your lips. I suspect it would be good on shoe leather. This was even a bit too spicy for me (rare!) Unless you are a total chile-head, capsaicin obsessed death-head sauce freak you might want to tame it down a tiny bit as I did. I added some olive oil and lemon juice to cut down the heat ever so slightly. I liked it better that way as I could use it more generously. You will use this in small amounts…a little goes a long way, especially right out of the jar as they make it. Its in the refrigerated section at TJ and costs $3. A steal. Shishito Peppers are a Japanese pepper variety, quite popular and common in Japan and just getting a bit known in the U.S. finally. But that might change soon, as they’re quite delicious — and especially now that you can find them so easily in your local TJ’s Produce Section, instead of having to look for them at a specialized Japanese grocery. 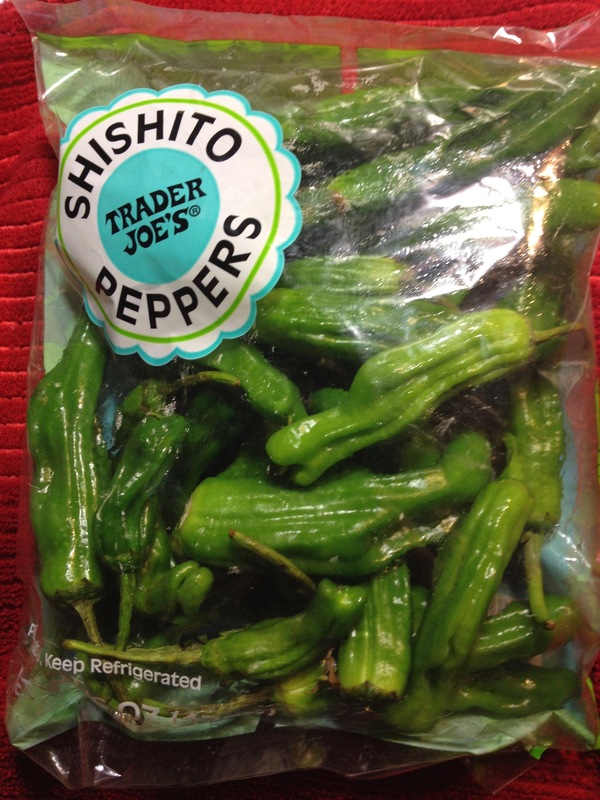 Shishito peppers are even a new “it” food you will see in upscale and trendy restaurants these days. RUSSIAN ROULETTE PEPPERS – NOT SPICY -vs- SPICY!! As a rule Shishito Peppers aren’t spicy. That is until you get a Spicy one! The general saying about them is: “1 in 10 will be spicy”. When you get a spicy one (my favorites) I would say they’re a bit less spicy than a jalapeño in level of kick. Meaning, yes it will be pretty spicy. So be warned, if you’re feeding them to your kid and grandma. If you bite into one and its spicy and you don’t like spicy, just put it to the side and the next one will in all likelihood be mild. 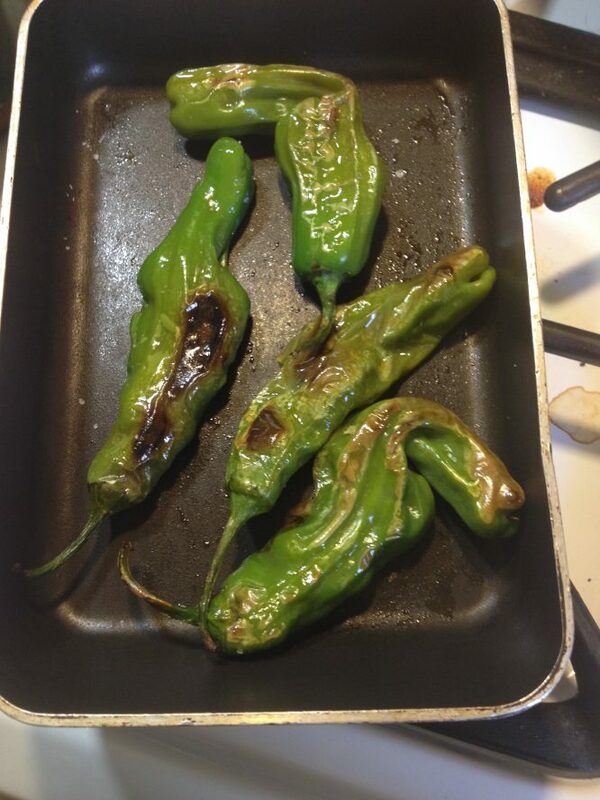 The usual way to make Shishito peppers are grill them in a pan over medium fire with a pinch of oil (sesame oil would be great) until they blister or get a tiny bit of char on one side, then turn them to the other side and do the same till cooked. Add a sprinkle of salt and pepper and they’re ready to serve. They can be a great little side dish, so they will go great with most anything you might serve as the Main. In Japan they are famous as a drinks snack served to go with beer or sake. You can also use them as an ingredient in foods, just as you would put in some green pepper. We really love them in our house, and you might too. Give them a shot. I always keep Couscous in my pantry as its incredibly fast and easy to make staple, far quicker to make than rice for example, it’s very tasty and versatile. Couscous (“koos-koos”) is a pasta-like grain, that is a staple in the North African cuisines of Algeria and Morocco. It’s even part of Sicilian cuisine, with all the Arab influence on its cuisine. 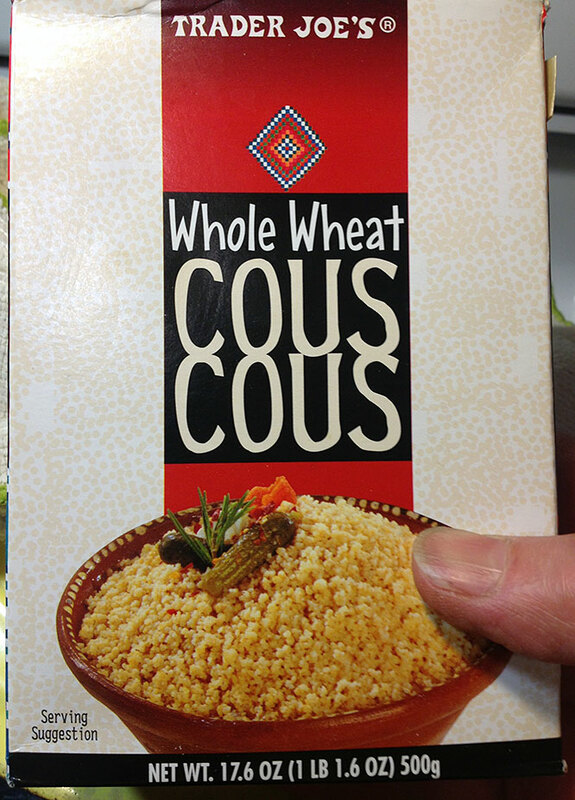 Couscous is made out of semolina wheat generally. 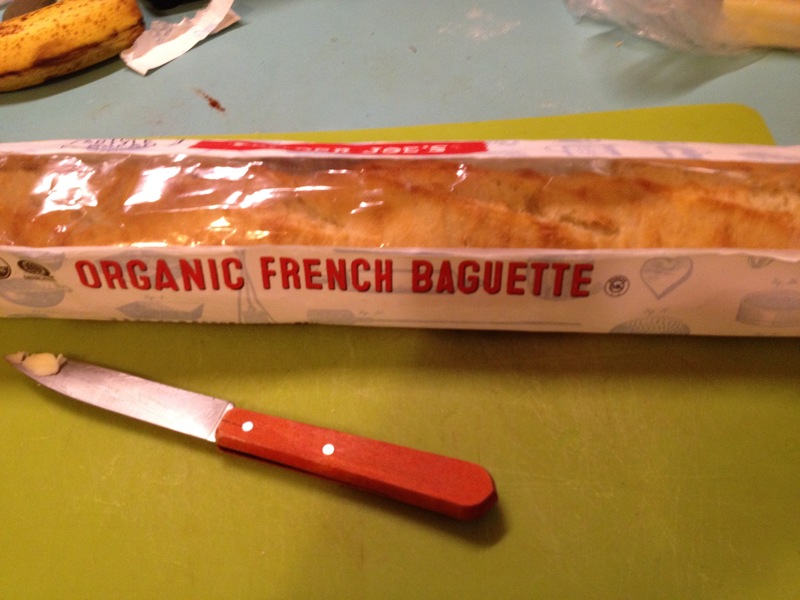 Trader Joe’s sells this whole wheat, whole grain version made from whole wheat (durum wheat) and says PRODUCT OF FRANCE. I lived in Paris for a while, and they have couscous restaurants like we have pizza places, as there are many people of North African origin. One of the reasons I love couscous, is it basically is ready in five minutes. Here’s the basic method: Put a cup of water in a pot. Bring it to a boil. Add Salt and Butter (or olive oil) Dump in a cup of this couscous, turn off the fire, cover the pot, and let it sit for five minutes. Thats it, done, you just fluff it up with a fork and it’s ready to serve. You can use couscous as a side dish, as you would rice or pasta. It really soaks up sauces or stews. Use it as a “bed” for your Main. You can do other things as well with it like serve it as a salad or tabouli, hot or cold. It would be a great base for a “protein bowl”. 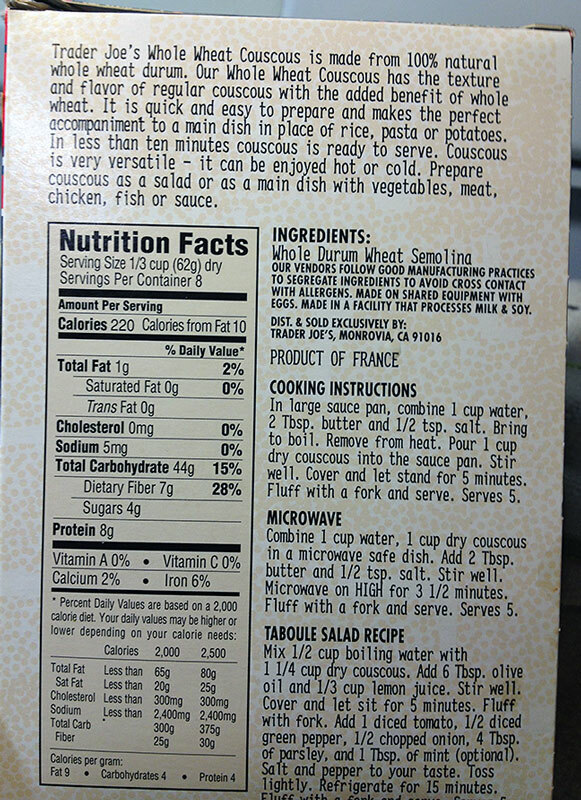 A box of Trader Joe’s French imported Whole Wheat Instant Couscous sells for only $1.99 for 500 grams, (a bit over a pound). This is an excellent product to always keep on hand in your pantry and try. Here are some links related to peruse. 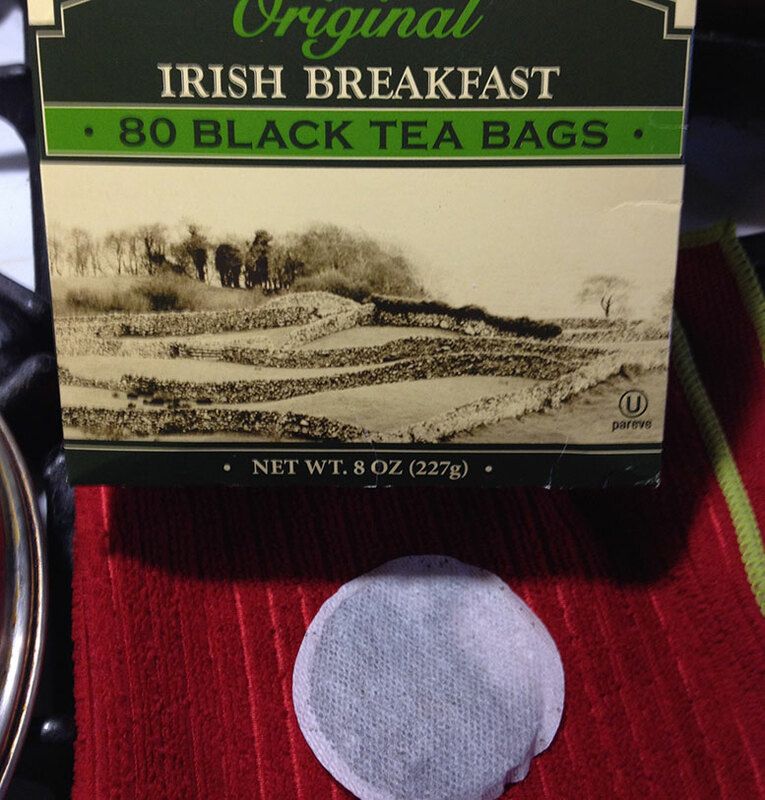 If you enjoy having a nice “cuppa”- and I really do – I think you will like TJ’s IRISH BREAKFAST TEA. 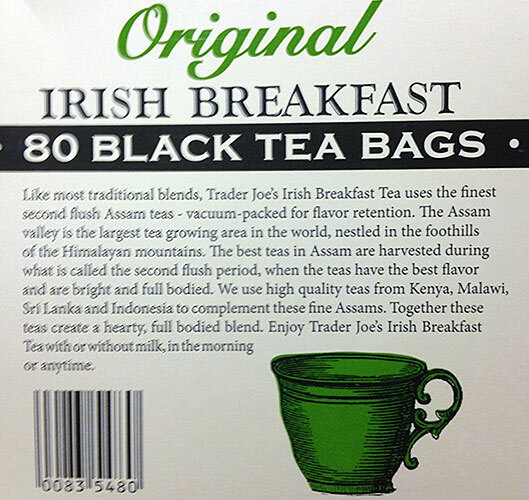 Trader Joe’s ORIGINAL IRISH BREAKFAST TEA BAGS is a newer incarnation from a previous version of “Irish Tea” they sold till they “revamped” it a year or two back? That previous Irish Tea packaging looked a bit different and tasted different too. This newer version is better than the previous version. Its has more flavor and is a stronger blend, which is what you definitely want in a cup of “Irish Tea” as Irish tea should be strong enough to stand up to milk and sugar, the way most people probably drink it there, as well as the UK. TJ’s gave the box a new look and the tea which was in a square bag, now comes as round tea bags (tagless, no string). They’re packaged inside in 2 foil wrapped packages with 40 tea bags each, which is great way to sell tea, as the foil wrapper keeps the tea totally fresh and airtight until you need to open the second little package of 40 bags. When you rip open the foil pack you will smell the tea easily, its got a very nice earthy (boggy?) deep tea aroma. To me this smells like good tea. According to the info on the box, the tea comes from 5 countries: India, Indonesia, Sri Lanka, Malawi, and Kenya. A box of this is 80 teabags with a Net Wt. of 8 ounces, which translates basically to mean each tea bag contains a decent amount of tea inside, enough to make a strong “cuppa”. When you see cheap tea that has 100 tea bags and says “6 oz” you already know that means there’s simply not enough tea in each bag to make a strong cup of tea. This is a black tea and properly steeped (4-5 minutes) the tea gives you a nice very strong, dark cuppa tea, with a deep reddish color. It is strong enough to stand up to a splash of milk and maybe sugar, if you take it that way. I do. 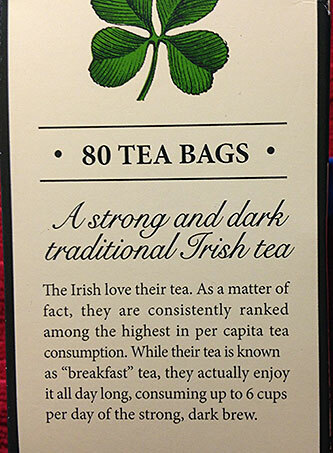 As the box says, “The Irish love their tea”. Us Yanks who do as well, can easily enjoy this brand of tea easily and affordably gotten at TJ’s to make their daily “cuppa”. 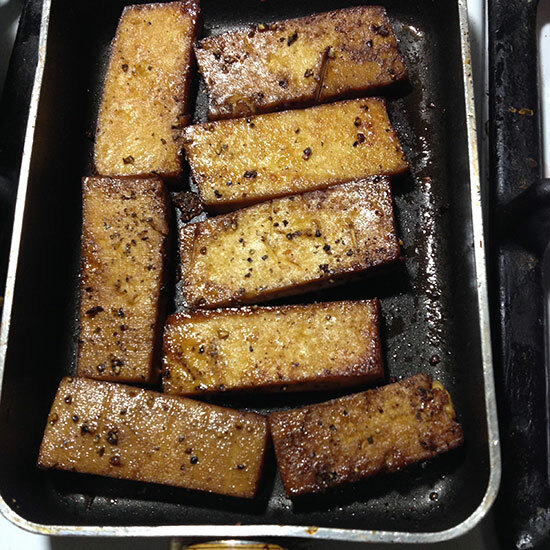 ORGANIC BAKED TOFU is a tofu that’s already been prepared, flavored in a marinade and baked. Baking tofu gets out a lot of water and it gives the tofu a firm texture, that is pleasantly chewy and well, “meaty”. It would be a very good substitute for say chicken in fact, and could be used as a ingredient in a dish like a stir fry or can be eaten on its own as the Main ingredient. As you can see from what I did with it, it can still be cooked (I grilled it up) which I think improves it’s flavor even more. 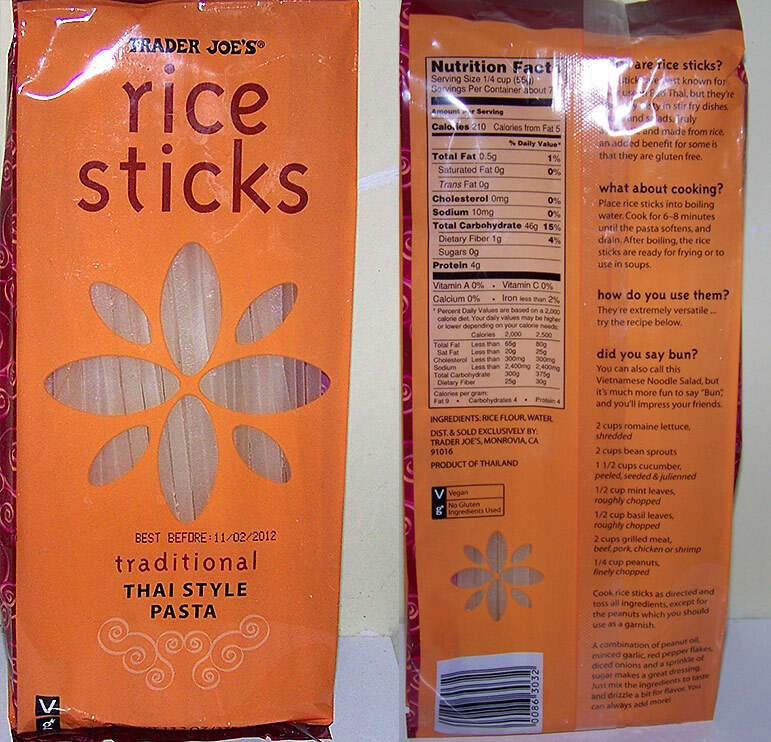 There are two versions at Trader Joe’s, a TERIYAKI flavor version and a SRIRACHA version. Though I am a big fan of Sriracha, I find the Teriyaki version has a better overall flavor profile and if you are trying this for the first time, suggest trying the Teriyaki version. But both are good, so do try both and see which you like. What I did with it here (as pictured below) is just cut it into slices and sautéed it in a non-stick pan with some Toasted Sesame Oil for about 5 minutes a side until it was golden brown. I added Soy Sauce and a little Sugar (two elements of Teriyaki sauce) and a good deal of fresh black pepper and cooked that for a few minutes more until the sauce has cooked in and thickened a bit. Garlic (and fresh ginger) would be great to add too, of course. You could also use this or the Sriracha version as the main protein plus veggies, with THAI CURRY SIMMER SAUCE. As the package says “be creative”. 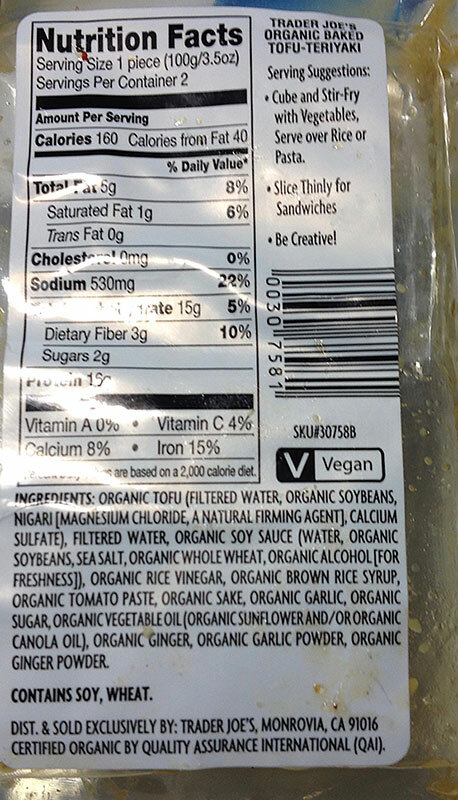 Let me begin with saying the regular Firm Organic Tofu from Trader Joe’s is very good… that one comes packaged in a container floating in water. This tofu does not come in water, it’s packaged in a tight fitting plastic wrapper. 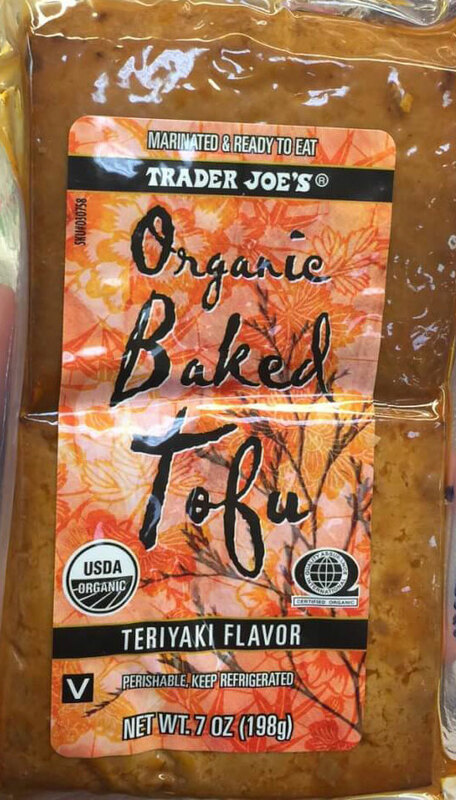 Anyway I saw this different product (“High Protein Tofu”) and thought I’d give it a try for the blog. 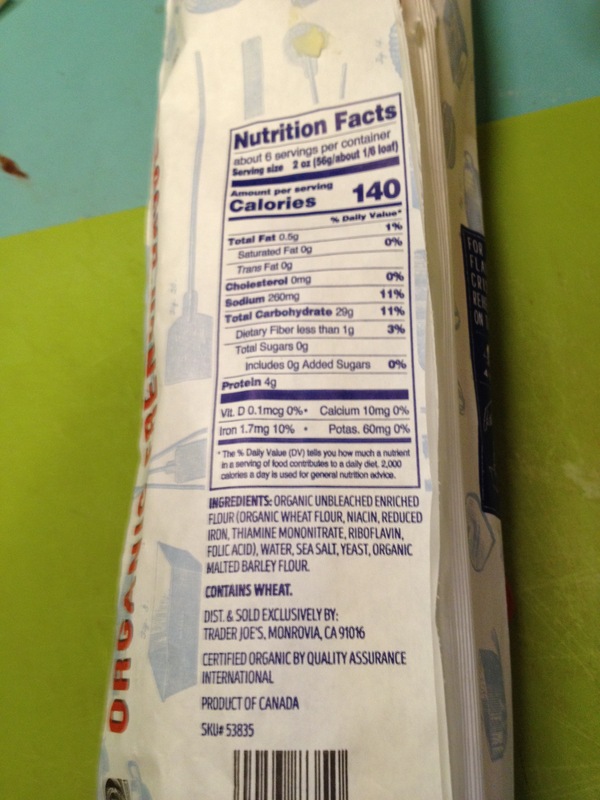 So here’s the shortest review I’ve ever given – High Protein Organic Tofu – its horrible! Super firm? They are not kidding about that. Picture in your mind, what “Shoe Leather made of Tofu” might be like…. then you will have some idea of the texture of this tofu product. Have you ever cut Tofu? Sure, your knife glides right through it.. Well this stuff, your knife has to be pushed with some pressure to cut it. It’s the texture of a soft tofu rock. “Super Firm”? The label should read “HARD & TOUGH”. I guess thats the “High Protein” at work? This stuff is so tough and chewy that its inedible. Its sounds kinda good when you look at it and think “oh it’s high protein, that must be better” but the reality is this extra protein must make it hard and tough and sucky. When I cooked it for dinner, and we ate it, we found it nearly inedible. We only choked it down because we were starving at the time. If you buy this stuff, you will also be sorry as I was. So you’ve been warned. Avoid this. PS The regular Firm Organic Tofu is very good and I highly recommend that! PPS This Tofu product (ORGANIC BAKED TOFU) they sell is fantastic. 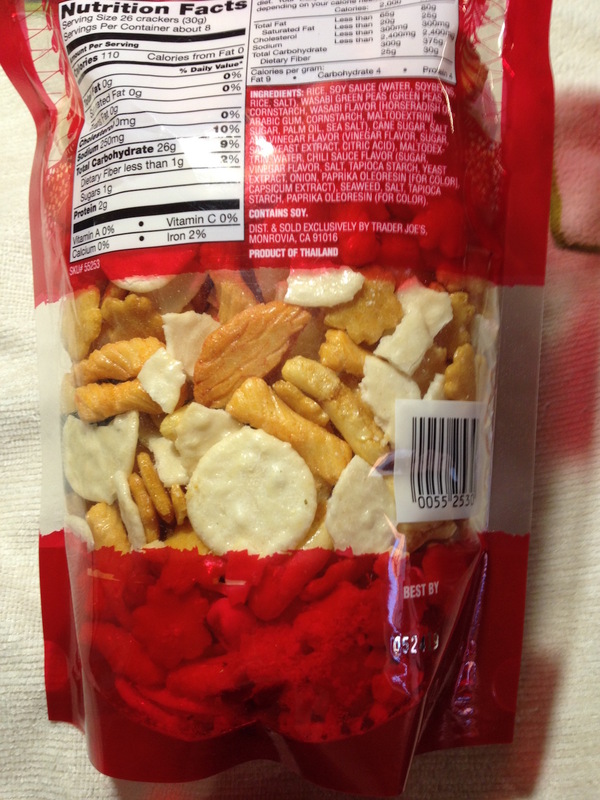 These are very tasty, very crunchy cracker type snacks. 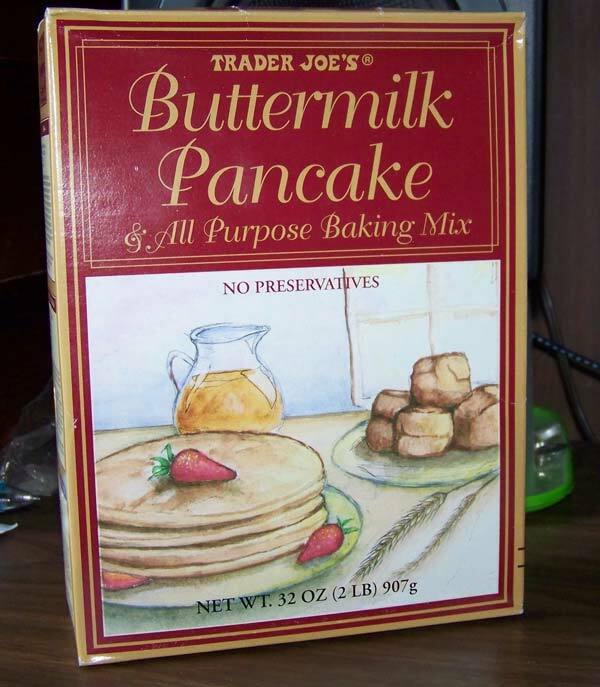 I would say these are one of my very top Trader Joe’s products. I usually buy a bag whenever I am there. A favorite snack food in Japan are SENBEI (pronouced Sen-bay). 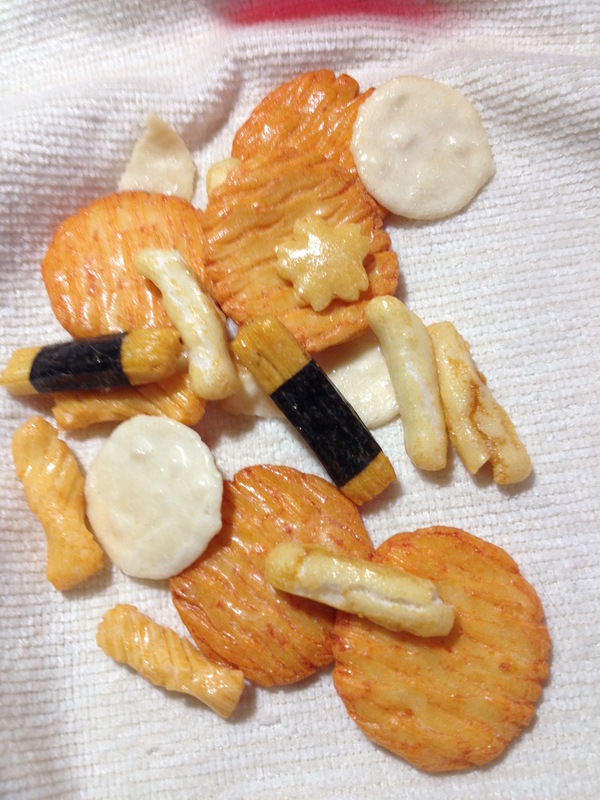 These “Rice Crackers” that TJ sells are a mixed variety of typical Japanese Senbei snacks. The package says that they are Made in Thailand. If I didn’t see this I would swear these were made in Japan as they are exactly like Japanese Senbei, of which I am really fond of and have tasted plenty! In the bag are a mixed variety of shapes and sizes as you can see in the photo here. There are both the flat cracker style ones, some short stick type ones, some plain and some coated with “nori” (seaweed). You don’t get more Japanese than these! 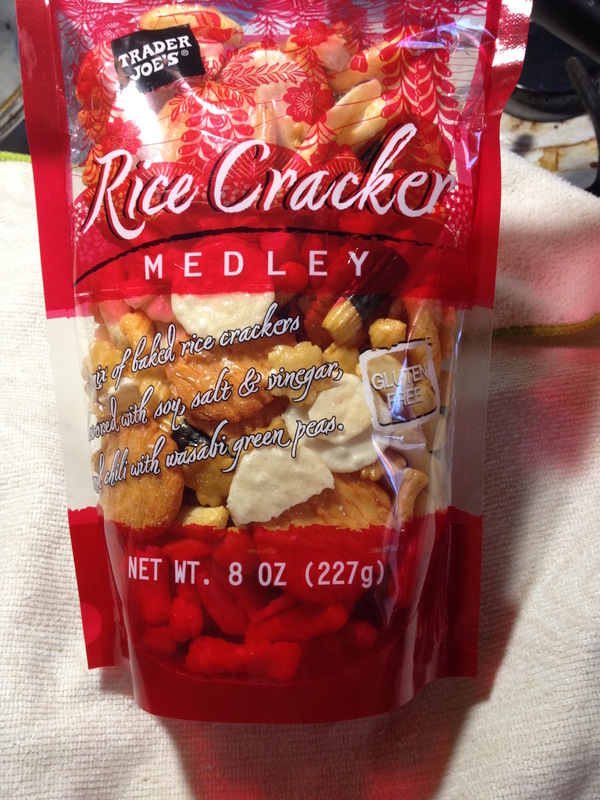 There are even some of the typical spicy “Wasabi Peas” you probably have tasted, in this Rice Cracker Medley. Every different kind is tasty. My favorite ones are the biggest round crackers, which are a little thick and SUPER crunchy. Trust me, when I say “super crunchy” you may not believe how “crunchy”, crunchy can be until you eat these. I’m talking LOUD, noises going off inside your head, you can barely hear, turn up the tv 10 notches, that crunchy, dig? These rice crackers have a great deal of “umami“, the “5th flavor” that Japanese covet, and which every chef in America is currently interested in. These crackers go great with beer, they match well with cheese, or you can just eat them on their own. To me, they’re so good, I classify these as a “dangerous” TJ product – meaning a bag in my house can go really FAST between myself and my wife (who’s Japanese, aha!). I could almost eat a whole bag (but I don’t). If you try these you will probably also love them, and want to buy them every time you visit TJ’s. 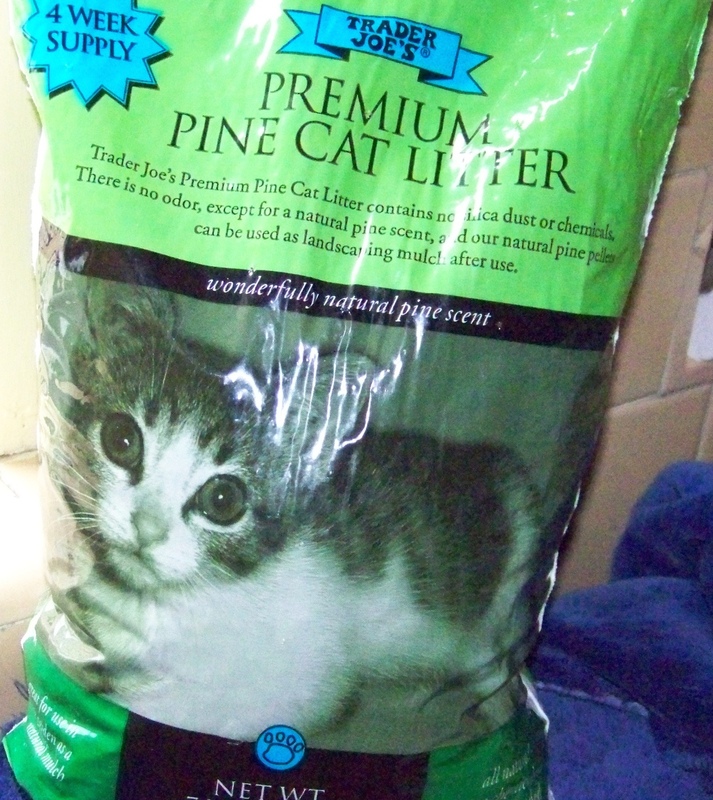 A bag costs $2.29, not a bad deal. TJ’s Refried Black Beans “With Jalapeños"